NEWARK, New Jersey, August 6, 2015 (ENS) – The air in Newark, New Jersey’s largest city, is expected to clear up now that the U.S. Environmental Protection Agency has finalized agreements with the Port Authority of New York and New Jersey and port terminal operators that will cut air pollution caused by idling diesel trucks at the port. Port Newark–Elizabeth Marine Terminal, a major component of the Port of New York and New Jersey, is the principal container ship facility for goods entering and leaving the New York metropolitan area and the northeastern region of North America. With a population of just under 300,000, the Newark metropolitan area has unhealthy air that does not meet the EPA’s air quality standards for smog. Smog and diesel exhaust particles pose serious health risks, including aggravating the symptoms of asthma and other respiratory problems. 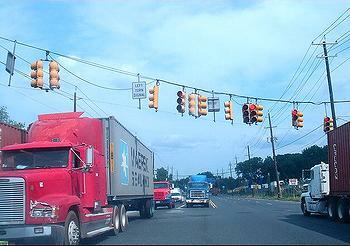 “Diesel pollution from idling trucks can make people sick and damage the environment. It is imperative that trucks, especially in heavily congested port areas, reduce idling,” said Judith Enck, EPA Regional Administrator. New Jersey State law prohibits diesel-powered motor vehicles from idling for more than three consecutive minutes when they are not in motion. Under the agreements reached in late July, the Port Authority, APM Terminals North America, Maher Terminals and Port Newark Container Terminals will reduce truck idling at the Port of Newark and take other actions to reduce harmful air pollution from diesel exhaust. The three port terminal operators signed these agreements to settle compliance violations of the three-minute rule. The violations involve causing, allowing and/or permitting the idling of diesel-powered trucks for more than three minutes at a time at the Port Newark Elizabeth-Port Authority Marine Terminal. Under these agreements, the Port Authority will provide $200,000 for truck owner-operators to replace their old trucks serving the port with newer, less-polluting trucks, and to place anti-idling signs on port roadways. The Port Authority will also provide funding up to $1.5 million for terminal operators who connect their cargo handling equipment to alternative sources of power such as electricity, if this funding is approved by its Board of Commissioners. In addition, the Port Authority will assist the truck operators to create a system to manage truck traffic to further reduce air pollution. The terminal operators will provide anti-idling instructions at gate entrances, install anti-idling signs, and undertake a variety of additional driver education efforts to reduce idling. The three major terminal operators also will provide a total of $600,000 to the City of Newark, to be used to pay for green infrastructure projects in areas that are most impacts by air pollution from port operations. These projects may include vegetative barriers, plantings, and landscaping. “We’ve also invested $600 million to build ExpressRail facilities at all port terminals, which have reduced hundreds of thousands of regional truck trips a year. Between 2006 and 2013, these initiatives helped contribute to a 33 percent reduction in tons per year of all pollutants, even while our cargo volumes grew by seven percent during that period. “Moving forward, we are working with port stakeholders to implement recommendations by the Port Performance Task Force, a group we helped conceive in late 2013, to improve truck efficiency and reduce idling,” the Port Authority stated. As part of President Barack Obama’s Climate Action Plan, the EPA also recently proposed new fuel efficiency rules for heavy-duty trucks.